Aberdeen manager Derek McInnes is determined not to give up the League Cup without an almighty fight and is focused on more cup final success. The Dons won their first trophy in 19 years following a penalty shoot-out win over Inverness CT last March. "We really enjoyed the experience of winning the trophy and it's ours until someone beats us," said McInnes. "We don't want to be talking about one cup final over the years to come. We want to be talking about the next one." Aberdeen are at home to Scottish Premiership leaders Hamilton Academical on Wednesday with a semi-final place up for grabs. The Dons took around 40,000 supporters to last season's final and McInnes would love to reward those fans with another big day out. "No one is going to give us the tie. We'll need to work extremely hard for it." "We know the importance of being successful at Aberdeen and that was highlighted at Parkhead in the Cup final, when you see what it means to so many people," he added. "It's important for the players to recognise that. "I firmly believe we have a team capable of getting to another final, but every team in the last eight will be putting that demand on themselves." Wednesday's game also presents Aberdeen with the opportunity to avenge a recent 3-0 loss at New Douglas Park. 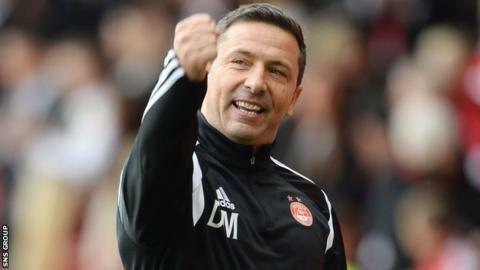 "It's a home tie and we hope we get the benefit of that," said McInnes. "But we know we're up against tough opposition. "No-one is going to give us the tie. We'll need to work extremely hard for it. "For me, it's not about what's happened before. It's important for us to be better than we were that night. "We weren't good enough against Hamilton and they deserved to win the match. "We lost poor goals. But the positives came in the following game (1-0 at home to Motherwell on Friday), when we showed that we can defend properly and play with good levels of concentration. "If we keep a clean sheet on Wednesday, I think we'll have opportunities to score. "We always try to be positive, but in both cups last season, we showed good consistency and came up with some big results."